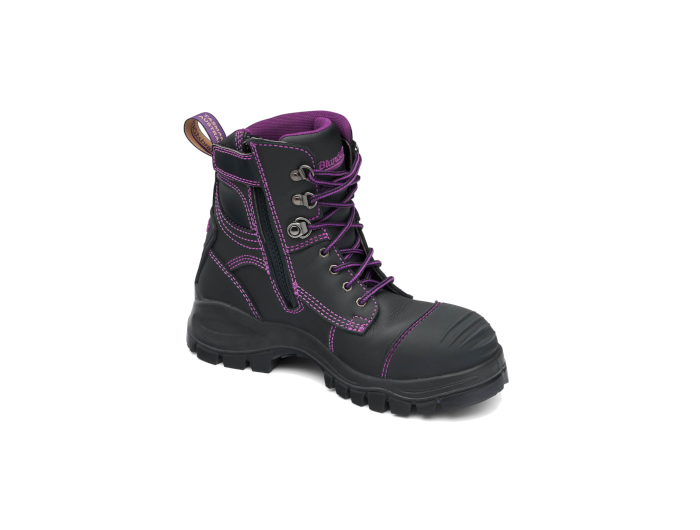 Designed and made specifically for women, the 897 will keep you safe and stylish on the worksite. 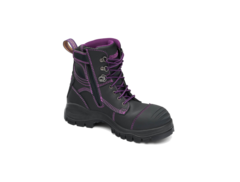 The sleek black leather upper is water-resistant, and zip sided for easy on easy off convenience. Packed with features to withstand tough environments, they’re designed to keep you safe and comfortable all day long. Padded collar and tongue and a breathable, anti-bacterial lining. Moulded TPU toe guard for added abrasion protection. A tough outsole that’s oil, acid and organic fat resistant and can withstand temperatures up to 300°C. The strong TPU rubber also protects against cuts and provides excellent slip resistance. Comfort is key – the PU midsole provides excellent shock absorption and added XRD® layers in the heel and forepart as well as the footbed ensure maximum satisfaction. A steel shank ensures torsional stability, keeping your joints safe while the steel toe cap is resistant to 200 joule impacts.